Every aircraft generates a wake while in flight. Initially, when pilots encountered this wake in flight, the disturbance was attributed to “prop wash.” It is known, however, that this disturbance is caused by a pair of counter-rotating vortices trailing from the wing tips. The vortices from larger aircraft pose problems to encountering aircraft. For instance, the wake of these aircraft can impose rolling moments exceeding the roll-control authority of the encountering aircraft. Further, turbulence generated within the vortices can damage aircraft components and equipment if encountered at close range. The pilot must learn to envision the location of the vortex wake generated by larger (transport category) aircraft and adjust the flight path accordingly. During ground operations and during takeoff, jet engine blast (thrust stream turbulence) can cause damage and upsets if encountered at close range. Exhaust velocity versus distance studies at various thrust levels have shown a need for light aircraft to maintain an adequate separation behind large turbojet aircraft. Pilots of larger aircraft should be particularly careful to consider the effects of their “jet blast” on other aircraft, vehicles, and maintenance equipment during ground operations. Lift is generated by the creation of a pressure differential over the wing surface. The lowest pressure occurs over the upper wing surface and the highest pressure under the wing. 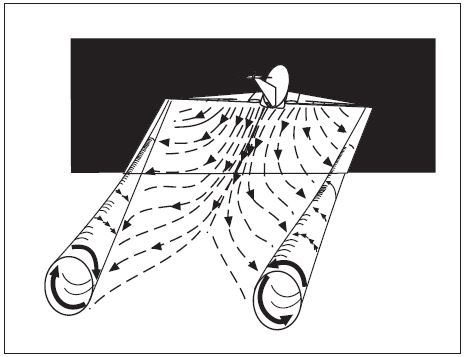 This pressure differential triggers the roll up of the airflow aft of the wing resulting in swirling air masses trailing downstream of the wing tips. After the roll up is completed, the wake consists of two counter-rotating cylindrical vortices. (See FIG 7-3-1.) Most of the energy is within a few feet of the center of each vortex, but pilots should avoid a region within about 100 feet of the vortex core. The strength of the vortex is governed by the weight, speed, and shape of the wing of the generating aircraft. The vortex characteristics of any given aircraft can also be changed by extension of flaps or other wing configuring devices as well as by change in speed. However, as the basic factor is weight, the vortex strength increases proportionately. Peak vortex tangential speeds exceeding 300 feet per second have been recorded. The greatest vortex strength occurs when the generating aircraft is HEAVY, CLEAN, and SLOW. In rare instances a wake encounter could cause inflight structural damage of catastrophic proportions. However, the usual hazard is associated with induced rolling moments which can exceed the roll-control authority of the encountering aircraft. In flight experiments, aircraft have been intentionally flown directly up trailing vortex cores of larger aircraft. It was shown that the capability of an aircraft to counteract the roll imposed by the wake vortex primarily depends on the wingspan and counter- control responsiveness of the encountering aircraft. Counter control is usually effective and induced roll minimal in cases where the wingspan and ailerons of the encountering aircraft extend beyond the rotational flow field of the vortex. It is more difficult for aircraft with short wingspan (relative to the generating aircraft) to counter the imposed roll induced by vortex flow. Pilots of short span aircraft, even of the high performance type, must be especially alert to vortex encounters. The wake of larger aircraft requires the respect of all pilots. Trailing vortices have certain behavioral characteristics which can help a pilot visualize the wake location and thereby take avoidance precautions. The vortex circulation is outward, upward and around the wing tips when viewed from either ahead or behind the aircraft. Tests with large aircraft have shown that the vortices remain spaced a bit less than a wingspan apart, drifting with the wind, at altitudes greater than a wingspan from the ground. In view of this, if persistent vortex turbulence is encountered, a slight change of altitude and lateral position (preferably upwind) will provide a flight path clear of the turbulence. Flight tests have shown that the vortices from larger (transport category) aircraft sink at a rate of several hundred feet per minute, slowing their descent and diminishing in strength with time and distance behind the generating aircraft. Atmospheric turbulence hastens breakup. Pilots should fly at or above the preceding aircraft's flight path, altering course as necessary to avoid the area behind and below the generating aircraft. (See FIG 7-3-4.) However, vertical separation of 1,000 feet may be considered safe. There is a small segment of the aviation community that have become convinced that wake vortices may “bounce” up to twice their nominal steady state height. With a 200-foot span aircraft, the “bounce” height could reach approximately 200 feet AGL. This conviction is based on a single unsubstantiated report of an apparent coherent vortical flow that was seen in the volume scan of a research sensor. No one can say what conditions cause vortex bouncing, how high they bounce, at what angle they bounce, or how many times a vortex may bounce. On the other hand, no one can say for certain that vortices never “bounce.” Test data have shown that vortices can rise with the air mass in which they are embedded. Wind shear, particularly, can cause vortex flow field “tilting.” Also, ambient thermal lifting and orographic effects (rising terrain or tree lines) can cause a vortex flow field to rise. Notwithstanding the foregoing, pilots are reminded that they should be alert at all times for possible wake vortex encounters when conducting approach and landing operations. The pilot has the ultimate responsibility for ensuring appropriate separations and positioning of the aircraft in the terminal area to avoid the wake turbulence created by a preceding aircraft. A wake encounter can be catastrophic. In 1972 at Fort Worth a DC-9 got too close to a DC-10 (two miles back), rolled, caught a wingtip, and cartwheeled coming to rest in an inverted position on the runway. All aboard were killed. Serious and even fatal GA accidents induced by wake vortices are not uncommon. However, a wake encounter is not necessarily hazardous. It can be one or more jolts with varying severity depending upon the direction of the encounter, weight of the generating aircraft, size of the encountering aircraft, distance from the generating aircraft, and point of vortex encounter. The probability of induced roll increases when the encountering aircraft's heading is generally aligned with the flight path of the generating aircraft. AVOID THE AREA BELOW AND BEHIND THE GENERATING AIRCRAFT, ESPECIALLY AT LOW ALTITUDE WHERE EVEN A MOMENTARY WAKE ENCOUNTER COULD BE HAZARDOUS. This is not easy to do. Some accidents have occurred even though the pilot of the trailing aircraft had carefully noted that the aircraft in front was at a considerably lower altitude. Unfortunately, this does not ensure that the flight path of the lead aircraft will be below that of the trailing aircraft. Remain in the touchdown area. Drift from aircraft operating on a nearby runway. Sink into the takeoff or landing path from a crossing runway. Sink into the traffic pattern from other airport operations. Sink into the flight path of VFR aircraft operating on the hemispheric altitude 500 feet below. Pilots of all aircraft should visualize the location of the vortex trail behind larger aircraft and use proper vortex avoidance procedures to achieve safe operation. It is equally important that pilots of larger aircraft plan or adjust their flight paths to minimize vortex exposure to other aircraft. Under certain conditions, airport traffic controllers apply procedures for separating IFR aircraft. If a pilot accepts a clearance to visually follow a preceding aircraft, the pilot accepts responsibility for separation and wake turbulence avoidance. The controllers will also provide to VFR aircraft, with whom they are in communication and which in the tower's opinion may be adversely affected by wake turbulence from a larger aircraft, the position, altitude and direction of flight of larger aircraft followed by the phrase “CAUTION - WAKE TURBULENCE.” After issuing the caution for wake turbulence, the airport traffic controllers generally do not provide additional information to the following aircraft unless the airport traffic controllers know the following aircraft is overtaking the preceding aircraft. WHETHER OR NOT A WARNING OR INFORMATION HAS BEEN GIVEN, HOWEVER, THE PILOT IS EXPECTED TO ADJUST AIRCRAFT OPERATIONS AND FLIGHT PATH AS NECESSARY TO PRECLUDE SERIOUS WAKE ENCOUNTERS. When any doubt exists about maintaining safe separation distances between aircraft during approaches, pilots should ask the control tower for updates on separation distance and aircraft groundspeed. Landing behind a larger aircraft- same runway. Stay at or above the larger aircraft's final approach flight path-note its touchdown point-land beyond it. Landing behind a larger aircraft- when parallel runway is closer than 2,500 feet. Consider possible drift to your runway. 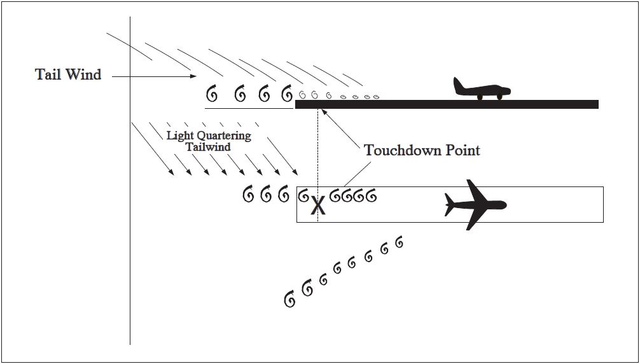 Stay at or above the larger aircraft's final approach flight path- note its touchdown point. Landing behind a larger aircraft- crossing runway. Cross above the larger aircraft's flight path. Landing behind a departing larger aircraft- same runway. Note the larger aircraft's rotation point- land well prior to rotation point. Landing behind a departing larger aircraft- crossing runway. Note the larger aircraft's rotation point- if past the intersection- continue the approach- land prior to the intersection. If larger aircraft rotates prior to the intersection, avoid flight below the larger aircraft's flight path. Abandon the approach unless a landing is ensured well before reaching the intersection. Departing behind a larger aircraft. Note the larger aircraft's rotation point and rotate prior to the larger aircraft's rotation point. Continue climbing above the larger aircraft's climb path until turning clear of the larger aircraft's wake. Avoid subsequent headings which will cross below and behind a larger aircraft. Be alert for any critical takeoff situation which could lead to a vortex encounter. Intersection takeoffs- same runway. Be alert to adjacent larger aircraft operations, particularly upwind of your runway. If intersection takeoff clearance is received, avoid subsequent heading which will cross below a larger aircraft's path. Departing or landing after a larger aircraft executing a low approach, missed approach, or touch-and-go landing. Because vortices settle and move laterally near the ground, the vortex hazard may exist along the runway and in your flight path after a larger aircraft has executed a low approach, missed approach, or a touch-and-go landing, particular in light quartering wind conditions. You should ensure that an interval of at least 2 minutes has elapsed before your takeoff or landing. En route VFR (thousand-foot altitude plus 500 feet). Avoid flight below and behind a large aircraft's path. If a larger aircraft is observed above on the same track (meeting or overtaking) adjust your position laterally, preferably upwind. In a slow hover taxi or stationary hover near the surface, helicopter main rotor(s) generate downwash producing high velocity outwash vortices to a distance approximately three times the diameter of the rotor. When rotor downwash hits the surface, the resulting outwash vortices have behavioral characteristics similar to wing tip vortices produced by fixed wing aircraft. However, the vortex circulation is outward, upward, around, and away from the main rotor(s) in all directions. Pilots of small aircraft should avoid operating within three rotor diameters of any helicopter in a slow hover taxi or stationary hover. In forward flight, departing or landing helicopters produce a pair of strong, high-speed trailing vortices similar to wing tip vortices of larger fixed wing aircraft. Pilots of small aircraft should use caution when operating behind or crossing behind landing and departing helicopters. Government and industry groups are making concerted efforts to minimize or eliminate the hazards of trailing vortices. However, the flight disciplines necessary to ensure vortex avoidance during VFR operations must be exercised by the pilot. Vortex visualization and avoidance procedures should be exercised by the pilot using the same degree of concern as in collision avoidance. Wake turbulence may be encountered by aircraft in flight as well as when operating on the airport movement area. 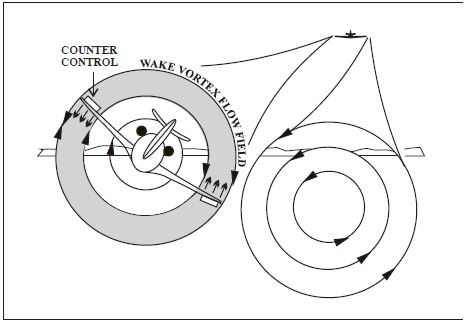 Pilot/Controller Glossary Term- Wake Turbulence. Pilots are reminded that in operations conducted behind all aircraft, acceptance of instructions from ATC in the following situations is an acknowledgment that the pilot will ensure safe takeoff and landing intervals and accepts the responsibility for providing wake turbulence separation. The acceptance of a visual approach clearance. For operations conducted behind super or heavy aircraft, ATC will specify the word “super” or “heavy” as appropriate, when this information is known. Pilots of super or heavy aircraft should always use the word “super” or “heavy” in radio communications. Super, heavy, and large jet aircraft operators should use the following procedures during an approach to landing. These procedures establish a dependable baseline from which pilots of in-trail, lighter aircraft may reasonably expect to make effective flight path adjustments to avoid serious wake vortex turbulence. Pilots of aircraft that produce strong wake vortices should make every attempt to fly on the established glidepath, not above it; or, if glidepath guidance is not available, to fly as closely as possible to a “3-1” glidepath, not above it. Fly 3,000 feet at 10 miles from touchdown, 1,500 feet at 5 miles, 1,200 feet at 4 miles, and so on to touchdown. Pilots of aircraft that produce strong wake vortices should fly as closely as possible to the approach course centerline or to the extended centerline of the runway of intended landing as appropriate to conditions. Pilots operating lighter aircraft on visual approaches in-trail to aircraft producing strong wake vortices should use the following procedures to assist in avoiding wake turbulence. These procedures apply only to those aircraft that are on visual approaches. Pilots of lighter aircraft should fly on or above the glidepath. Glidepath reference may be furnished by an ILS, by a visual approach slope system, by other ground-based approach slope guidance systems, or by other means. In the absence of visible glidepath guidance, pilots may very nearly duplicate a 3-degree glideslope by adhering to the “3 to 1” glidepath principle. Fly 3,000 feet at 10 miles from touchdown, 1,500 feet at 5 miles, 1,200 feet at 4 miles, and so on to touchdown. Pick a point of landing no less than 1,000 feet from the arrival end of the runway. Establish a line-of-sight to that landing point that is above and in front of the heavier preceding aircraft. When possible, note the point of landing of the heavier preceding aircraft and adjust point of intended landing as necessary. A puff of smoke may appear at the 1,000-foot markings of the runway, showing that touchdown was that point; therefore, adjust point of intended landing to the 1,500-foot markings. Maintain the line-of-sight to the point of intended landing above and ahead of the heavier preceding aircraft; maintain it to touchdown. Land beyond the point of landing of the preceding heavier aircraft. During visual approaches pilots may ask ATC for updates on separation and groundspeed with respect to heavier preceding aircraft, especially when there is any question of safe separation from wake turbulence. Because of the possible effects of wake turbulence, controllers are required to apply no less than specified minimum separation to all IFR aircraft, to all VFR aircraft receiving Class B or Class C airspace services when operating behind super or heavy aircraft, and to small aircraft operating behind a B757. Heavy behind super - 6 miles. Large behind super - 7 miles. Small behind super - 8 miles. Heavy behind heavy -4 miles. Small/large behind heavy - 5 miles. Small behind B757 - 4 miles. Small landing behind heavy - 6 miles. Small landing behind large, non-B757 - 4 miles. Pilot/Controller Glossary Term- Aircraft Classes. Two minutes or the appropriate radar separation when takeoff will be behind a heavy aircraft. Two minutes or the appropriate radar separation when a small aircraft will takeoff behind a B757. In the opposite direction on the same runway behind a large aircraft (except B757) takeoff or low/missed approach. This 3-minute interval may be waived upon specific pilot request. In the opposite direction on the same runway behind a B757 takeoff or low/missed approach. This 3-minute interval may not be waived. A 4-minute interval will be provided for all aircraft taking off behind a super aircraft, and a 3-minute interval will be provided for all aircraft taking off behind a heavy aircraft when the operations are as described in subparagraphs b1 and b2 above, and are conducted on either the same runway or parallel runways separated by less than 2,500 feet. Controllers may not reduce or waive this interval. Pilots may request additional separation (i.e., 2 minutes instead of 4 or 5 miles) for wake turbulence avoidance. This request should be made as soon as practical on ground control and at least before taxiing onto the runway. Controllers may anticipate separation and need not withhold a takeoff clearance for an aircraft departing behind a large, heavy, or super aircraft if there is reasonable assurance the required separation will exist when the departing aircraft starts takeoff roll.